Imagine trusting a doctor--with the best reputation in the state--to do surgery on your eyes. Now imagine the worst of outcomes. Blindness in an eye that you learn, in fact, never needed surgery. And the medical center where you were treated is ignoring the problem. Waking Up Blind is the story of how an eye surgeon became the cause of an array of medical problems for his patients. It is also the story of how one of the nation's premier medical centers tried to conceal the growing scandal. The faculty who exposed the problems were punished. Official committees and the university leaders minimized the misconduct. Slowly, lawsuits and publicity brought some to light in bits and pieces. With the use of court documents, transcripts of tape-recorded conversations, interviews, and personal observation, Dr. Tom Harbin presents this case from the very beginning, uncovering all levels of wrongdoing and secrecy. Waking Up Blind will shock the reader with its candid exploration of the dark side of medicine. Dr. Duffy Jones received his DVM from Tufts in 1999 and served his internship in Atlanta. He has practiced in Atlanta since 2000 and founded the Peachtree Hills Animal Hospital in 2005. He has had numerous leadership positions in veterinary organizations and has spoken and taught widely. He resides in Atlanta with his wife, three children, dog and cat. Dr. Tom Harbin recieved his MD from Cornell University and trained in ophthalmology at the Wilmer Institute of Johns Hopkins. He received his MBA from Georgia State University in 1991. He has practiced ophthalmology with a specialty in glaucoma for over thirty years and is a Clinical Professor Emeritus at Emory University. He resides in Atlanta, Ga. with his wife. The Business Side of Medicine.. What Medical Schools Don't Teach You is his second book. 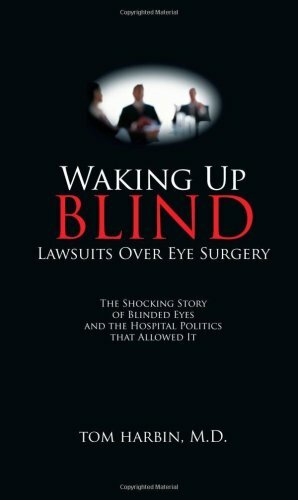 His first book was Waking Up Blind...Lawsuits over Eye Surgery, an Amazon bestseller.